Despite its enormity, however, it’s hard not to notice that, in many ways, the record sounds like one of the shortest, tightest things this band has ever done; indeed, where previous albums have sometimes been hard to get through in one sitting, Brighter’s nineteen tracks seem to fly by. There are a number of reasons for this, and all of them are good news for Truckers fans—eleven years into their career, the Truckers sound for the first time like they’ve shaken off their critics and come into their own as a band, playing with more confidence and a more assured sense of identity than ever before, reinforcing what’s important to them as a band while showing that they’re still hungry to push their music further. Part of what makes Brighter so engrossing is that, unlike Southern Rock Opera or The Dirty South, there’s no conceptual heft here that threatens to make these songs topple under their own ambitions. The narrative and thematic hooks that mark their most famous albums has long been a part of what makes the Truckers special, but shaking off such lofty ambitions and focusing on individual songs—which they do here, as they did on A Blessing and a Curse—seems to have freed them up as storytellers. And best of all, focusing on the simple truths of the stories they’re telling has, by turn, made these some of the most profound and universal songs the band has ever cut. “The Righteous Path,” in telling its story of a family man trying to keep on the straight and narrow, never tries to be a political or cultural allegory, and that focus on simple storytelling is precisely what gives it such thematic heft and resonance. Likewise, “The Purgatory Line” is a tale of conflicted emotions and painful waiting so tenderly and delicately told that it transcends the details of its love story and becomes a much broader, more primal song about longing. Another triumph of the album is that the Truckers have found the balance they’ve been searching for over their last few albums, neither playing up their Southern roots to the point of caricature nor downplaying them to the point of featurelessness. Albums like Decoration Day and The Dirty South captured the contradictions of life in the American South better than any other rock album I can think of, but occasionally their portrayals of Southern life feel a bit strained or stilted, like they’re trying too hard to fit into a certain mold. By contrast, A Blessing and a Curse mostly eschewed the Southern preponderance, and the songs sometimes felt like they’d been stripped of their most distinguishing characteristics as a result of it. Here, the Truckers sound like they’re found peace with their own identity as a band; their songs don’t sound like they’re trying too hard to be Southern, nor do they sound like they’re trying too hard to avoid the associated clichés. They’re simply stories written from a place of personal experience, and they’re specific in their details without compromising the universality of their themes. On top of all of this, the Truckers are more ambitious and diverse in their sound than ever before, turning down the amps and emphasizing acoustic ballads and country shuffles more than thundering hard rock. There are still rockers, to be sure—“The Righteous Path” and “The Man I Shot” are pure primal fury, and “3 Dimes Down” is a classic DBT mix of Skynard riffs, country twang, and heavy metal ferocity—but many of these songs are less about raw power and more about the details of the production. John Neff’s steel guitar adds a ghostly element to many of these tracks, and Muscle Shoals keyboard legend Spooner Oldham brings a dash of Southern soul to everything he touches. 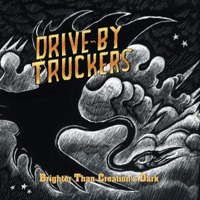 Add to that the heavenly harmony vocals contributed by bassist Shonna Tucker and you have the richest musical palette the Truckers have ever worked with, and, consequently, the album opens itself up more and more with each listen. These little details are especially welcome in the wake of Jason Isbell’s absence; the Truckers no longer boast the three-axe attack they’ve become famous for, and they’re wise for not trying to replicate that sound, but, rather, for taking Isbell’s departure as an opportunity to expand and refine their sound. The third songwriter, of course, is no longer Jason Isbell, but, rather, his ex-wife, Shonna Tucker, who makes her debut as a singer and songwriter here, turning in three songs that all happen to be album highlights. “I’m Sorry Houston” is a beautiful song of regret; “Home Field Advantage” is pained and tragic and doesn’t pull any punches; and “The Purgatory Line,” in which she’s backed only by skeletal percussion and spectral guitar notes, is the gutsiest thing the Truckers have ever recorded—not to mention the most beautiful. Of course, with so much material, most listeners are bound to find a song or two they don’t care for as much—personally, I could live without the clumsy, cautionary don’t-do-drugs lyrics of Hood’s “You and Your Crystal Meth”—but, if anything, the album’s sprawl and far-reaching ambitions only add to its charms. Here the Truckers veer off into a number of exciting directions, and they come through a period of transition sounding like they’ve not only survived, but emerged more focused and energized than ever before. As they enter into their second decade, this album comes as a good omen, but, more than that, it feels like a genuine triumph—the sound of one of America’s best bands discovering that, even when you’re at the top of your game, it’s still possible to move onward and upward.